Today I’m rounding up my favorite bits from the interwebs this week, things that I’ve found interesting, useful or simply entertaining. What a fabulous method for making perfectly-pointed collars from Off The Cuff. As I’m preparing to work on my Minoru muslin I’ve been looking for useful instructions about dart manipulation. I found these two posts about moving darts to side seams and general dart manipulation. They don’t answer all my questions but they’re a useful jumping off point. This post from In House Patterns about back and neckline shaping is also helpful. I’ve just started watching The Great British Sewing Bee and was checking out Lauren’s website. Lauren was a runner up in the first season. She posted a review ten days ago of the show’s newest accompanying book, The Great British Sewing Bee: Fashion with Fabric, along with one of her makes from the book. The skirt is nice and all, but I am OBSESSED with the shirt she’s wearing with it. Lauren admits in the comments that it’s a store-bought shirt, but I’m determined to figure out a way to copy it! And those buttons on the yoke! I mentioned before that I was calling last week Selfish Sewing Week because I was on spring break and had a bunch more time to sew. I didn’t get quite as much done as I was hoping to but I made some pretty awesome progress on a few things. The big accomplishment last week was that I got a muslin made of my Ginger Jeans. I’d been trying to figure out a mash up of the two versions, a lower waist with skinny legs. I think I’ve managed to try to do this the harder way by slimming out the legs on the version with the lower waist instead of lowering the waist on the version with the skinny legs. I made some pattern alterations ten days ago and then on Thursday I got it stitched up. I’d ended up taking off 3/4 of an inch on both sides of the leg, front and back, grading out to nothing a couple inches above the knee. I also took out two inches of length at the knee. I’d been sort of worried that the pattern pieces as I’d cut them out, in a size 8, just looked way too big. Fortunately I was pretty happy with my muslin. I’d decided to make a real muslin instead of just basting together my real denim because other than my Hudson pants I’ve never made pants before. As I was trying to make a number of alterations, in ways that I’ve never done before, it seemed like it made sense to put in the small amount of time to do a muslin. I discovered that I most certainly took out too much width on the legs. I tried to hard to get that muslin on but couldn’t get it pulled up all the way. I looked pretty ridiculous trying to make that happen. I ended up just chopping off the pants at the knees and was able to get them on and get them all the way up. And guess what?? They fit!! I’m going to add 3/8 of an inch back into the legs when I cut my denim. I’ll baste them though since I don’t know how the stretch in the denim will work itself out. I can’t wait to start working on these. 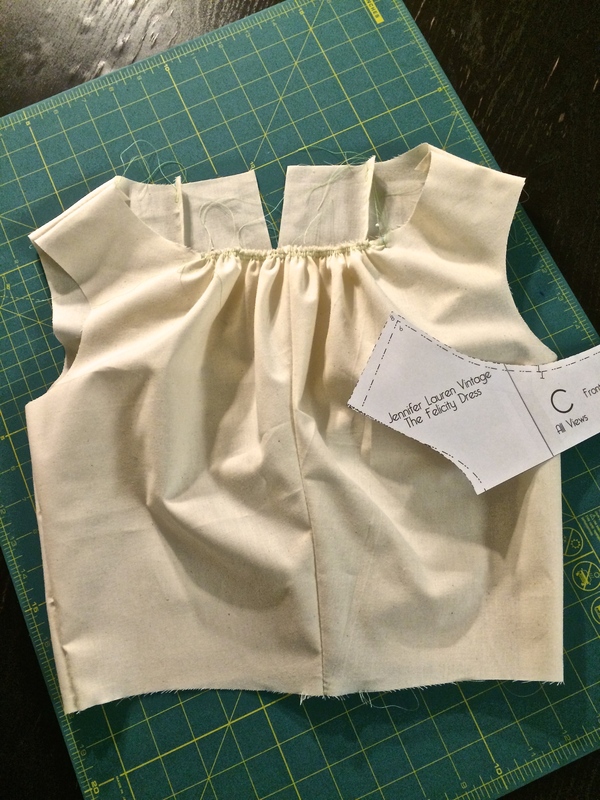 I also made a muslin of the Felicity Dress bodice. I was a little concerned when I read that she drafts for a D cup, which I most certainly am not. But I think because the bodice has gathers instead of darts it works pretty well. I also finished off clipping threads and such on my Sutton Blouse and got the pleats hand-basted on my Natalie top. Hopefully I can finish Natalie off soon and it’ll be warm enough that I can take photos of those. Finally, I got a quick make cut out over the weekend. I fell hard and fast for this reversible sweater knit at Joann’s last week. It’s not made of synthetics!! Rayon and cotton all the way. I’m cooking up something awesome, you’ll have to check back later to see how it worked out. Hoping to get a muslin for Minoru started soon. And I’ve got a couple small quilting things to finish up. Busy busy busy around here. I’ve been looking recently at the Carme Blouse by Pauline Alice. At first I was wondering if it was a bit too stiff looking for me but this swiss dot version is absolutely lovely. I even have some swiss dot that I bought for a project I decided not to do. That’ll definitely be going on my project list. I’ve made a couple different bags that I use as luggage, but it’s been a while since I made them and my skills have definitely improved so I’ve been thinking about making a new bag for some of the traveling that I will do this summer. The Cargo Duffle by Noodlehead has been on my list and this version from Coconut Robot that I found yesterday has inspired all sort of plans and modifications. When my real sewing adventures began about two years ago, quilting was what I thought I’d stick with. I’ve moved on from there but am still inspired by the modern quilting movement. There’s something so satisfying about older blocks remade in the bright, vibrant quilting cottons now available. An instagram photo led me to sotosewn and I’ve been enjoying looking at her quilts. I’ve been totally lacking in free time at home recently so I haven’t made as much progress as I’d like on the projects I’ve outlined. But I have been spending some time (at work and commuting to and from work) looking out for tips and tricks that will help me customize projects. Things like different pockets for my Archer, in whatever form it may take and petite adjustments for my Ginger jeans. I’m also swimming in ideas for customizing my Minoru jacket. Sewing this jacket will certainly be the most involved project I’ve taken on so far and perhaps I shouldn’t be using that as the reason to pull out all the bells and whistles. But instead I’m feeling like, if I’m going to tackle a big project and put so much time and energy into it, it might as well be a jacket that has all the details I’m looking for. I’ll be making a muslin to check fit, and the construction doesn’t really involve that many things I haven’t done before. So I’m going big. I still haven’t decided on inseam pockets vs patch pockets vs welt pockets. I’ve been contemplating replacing the neck gathering with pleats or darts, and I think I’m definitely going to be adding a fifth placket piece to lay under the zipper and keep the cold zipper from my skin and the top of it from rubbing uncomfortably against my chin. I’ve also just generally been lurking on the sew-along pages for all of the projects I’ve got planned. The Minoru, Archer, and Ginger sew-alongs are all over so I’m really just using those as tips. But the Felicity Dress sew-along is just getting started and I’m hoping to actually participate in that. She’s planning a pretty long sew-along schedule so I may end up finishing early but I enjoy the detailed instructions that come with this sort of thing. Jen’s review over on Grainline Studio of the Fabric for Fashion books definitely caught my eye. This set of books (sold separately) includes Fabric for Fashion: The Complete Guide and Fabric for Fashion: The Swatch Book. While I’d love to own both some day, the swatch book is going straight to my birthday list. One thing I certainly miss out on by being a self-taught seamstress instead of a school-taught one is all the instruction about different fabrics and that’s something I’d really like to know more about. 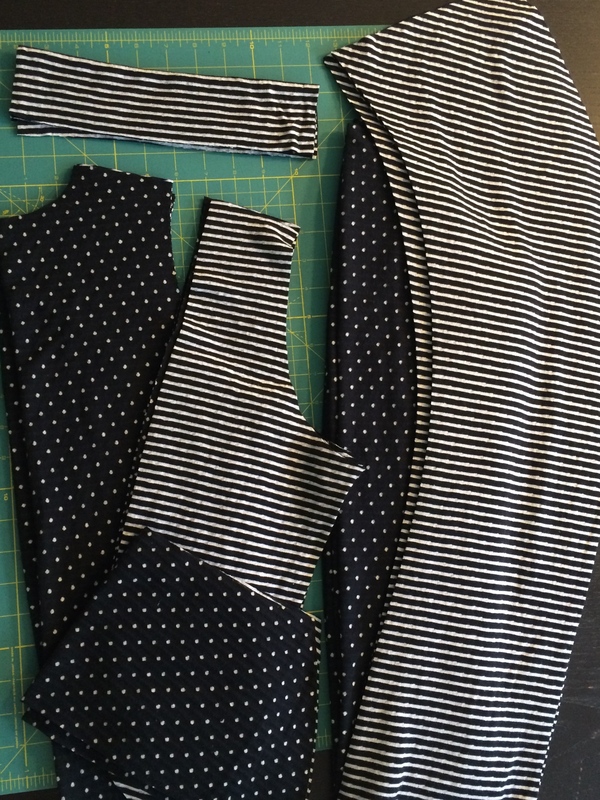 I’m loving the shirt length versions of the Marianne Dress that Amber over at Fancy Tiger Crafts made for Selfish Sewing Week. I’ve got a few single yards of jersey that I could definitely throw together to make some super cute tops. I can’t even handle how fantastic this Minoru jacket it. Purple is totally my color, the sheen on the fabric is gorgeous, and Birgitte has added some awesome details. This post on Sew Mama Sew about printing your PDFs at a copy shop caught me at just the right time. I’m definitely a PDF pattern over printed pattern kind of gal. As much as I don’t enjoy all the printing, cutting, and taping, I like not having to trace patterns and I like knowing that I can always just print something out again. But I balked a bit when I saw how many pages I’d have to print out for the Minoru jacket I’ve got planned. 61 pages feels like an awful lot of cutting and taping, especially when I already feel like I don’t have enough sewing time. 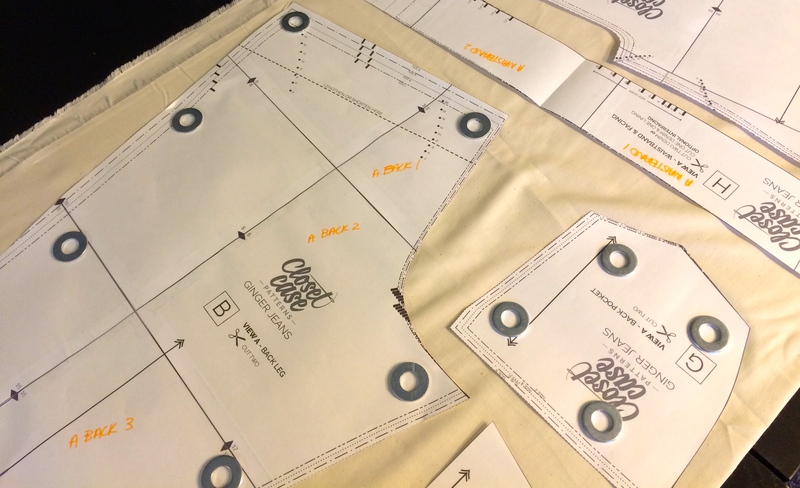 I’ve got to do a little investigating to find the right place to print my patterns but depending on the pricing I may start doing that regularly with all the patterns that offer a copy shop version. This article certainly gave me the info I need to check out this option.